Gazing intently at tablet screens, a number of gamers were absorbed in manoeuvring a submarine to follow bubbles and accumulating coins along the way. Meanwhile, at the other end of the Bay Arena, a group of people were listening attentively to a panel discussion debating the state of the digital games industry in Malta. 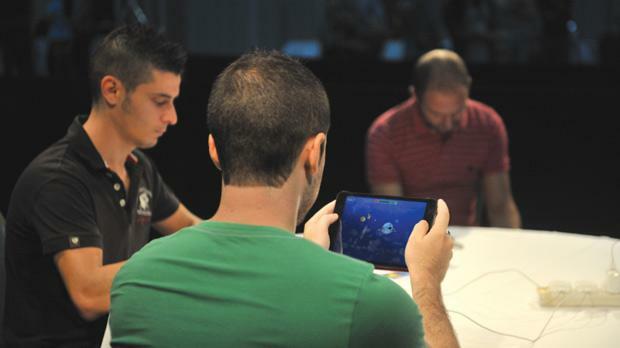 Malta’s first gaming convention, PixieCon13, attracted around 200 people yesterday – developers, artists, designers and other game development professionals gathered at the arena to share their passion for creating games. The convention was organised by Pixie Software – an independent digital game development studio focusing on casual games for mobile platforms. The company’s managing director is 27-year-old Stephen Caruana, who admitted that his company has no employees – except himself. The developer single-handedly organised the convention, flying in speakers from the International Game Developers Association (IGDA) and Unity Technologies, the developers of one of the most popular licensed 3D game engines. He also announced his first game, Trail of the Treasure Snatcher, which he created with Mcast students. It will be launched in November and will be playable on Apple devices for free. The convention provided a great networking opportunity for the growing digital gaming community in Malta. “I received CVs from interested people. The gaming industry is very heterogeneous – you have people involved in coding, designing, composing music – you name it. IGDA executive director Kate Edwards said PixieCon13 was a great start, helping build the necessary momentum for creating games. What tips does she have for Maltese game developers? “You must be passionate but also know your strengths. Ms Edwards added that potential developers should have the ability to work in a team. She advised indie companies to be resourceful and work with affordable software that was available on the market. Product evangelist of Unity Technologies Andy Touch added that Malta had the advantage of have the backing of the education system. “Games are cross-platform: they incorporate physics, maths, gravity and transferable skills such as audio. I can’t stress enough the importance of such events where people can come together to create their scene,” he said.